This is some of the best traditional African music ever recorded. The music is the star – of course – then come the wonderful musicians who performed it, but it was the recordists who make it possible for us to listen to the genius in African music captured on these magnificent tracks. After having released the 22-cd series 'Historical Recordings by Hugh Tracey', it is time to pay homage to some who came after him. Thanks to Charles Duvelle, Jos Gansemans, Benoit Quersin, David Fanshawe, for these great recordings. Each track is a gem. There is nothing coincidental in this music: it is based on a deep understanding of interconnectivity – consequently also of time and space – and has been developed over many centuries. Yet it sounds so modern! Each track has its own swing, and this danceable quality is a profound thing – it is participatory, revitalising, communal, relaxing, healing. Total time: 73'32". 24 page booklet. Tracklist: 1. Obama Ondoua Ebini (rec. in Cameroun by Charles Duvelle), 2. Horn Ensemble (rec. in Congo by Charles Duvelle), 3. Kutomboka Dance (rec. in D.R. Congo by Jos Gansemans), 4. Madimba Xylophone Duet (rec. in D.R. Congo by Jos Gansemans), 5. Mbilé (rec. in Chad by Charles Duvelle), 6. Massikoulou Orchestra (rec. in Congo by Charles Duvelle), 7. Alur Horns (rec. in Uganda by David Fanshawe), 8. Tshisani (rec. in D.R. Congo by Jos Gansemans), 9. Teka Dya Kingudi (rec. in Angola by Charles Duvelle), 10. Sirhélé (rec. in Chad by Charles Duvelle), 11. Gandja (rec. in Central African Republic by Charles Duvelle), 12. Eshidi (rec. in D.R. Congo by Benoit Quersin). The Wire 2014 (GB): "A chorus of boat horns, the Sun Ra Arkestra, gridlock in paradise, the Globe Unity Orchestra, a herd of wildebeest laying siege to Jericho......To be frank, I have no adequate way to convey the rough beauty of these tracks." Rootsworld 2014 (USA): "Percussionist and SWP label owner Michael Baird has curated 73 minutes of rural Central African musical hypnosis. 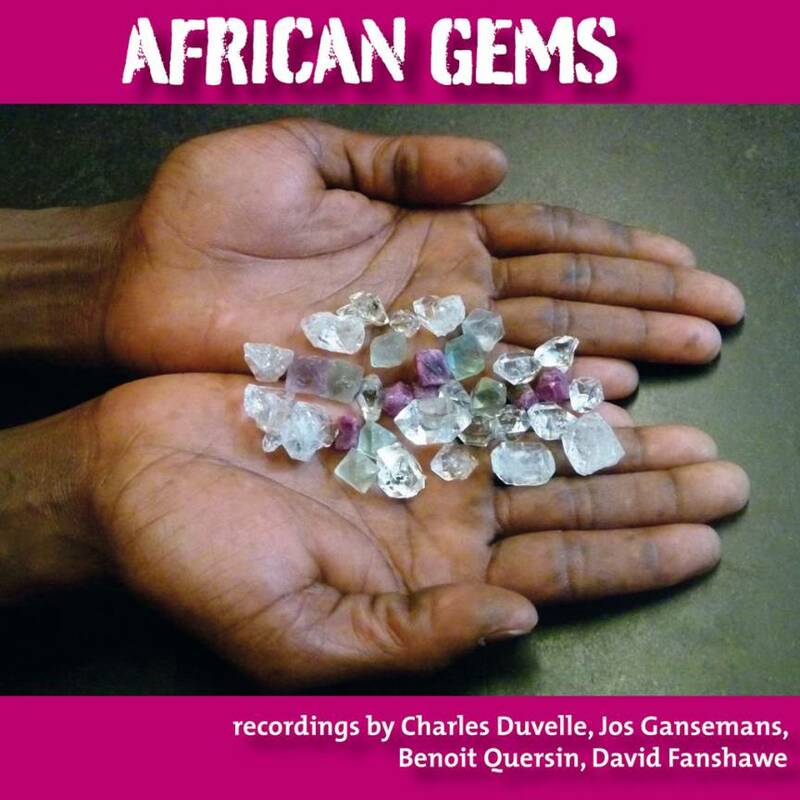 From ensembles to duets to one solo piece, this collection is as varied as it is stellar, and it does a fantastic job of reminding listeners of the work Duvelle, Gansemans, Quersin and Fanshawe did.....Easily some of the best traditional sub-Saharan African music ever put on tape."